This card is the real thing. I love playing this early in arena when my opponent has no answers for it or when I have answers to keep it alive for a long time. This card is by far the most annoying one among the new cards. Nice. Now a better card than undertaker. It's like one of the many 2 mana 3/2s. This one just grows. think of it as a superior bloodfen raptor. I agree with everything others have said, this is an incredible (probably OP) 2 drop. 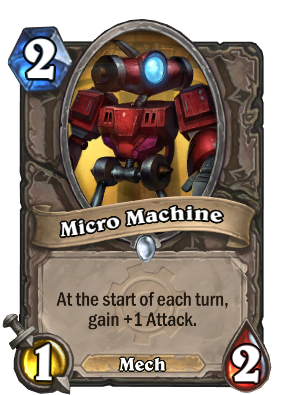 Just imagine how insane this could be in a Priest deck with Power Word: Shield and Upgraded Repair Bot. if you are not prepared it can be deadly. He never goes hungry because he packs a big lunch. honestly this guy is completely overpowered it forces the opp. to automatically use a spell on him unless they already have a minion on the board, but even then if you get rid of that then nothing can stop this little guy. As long as he is protected he becomes more op than undertaker. Edit: I say this as someone who has the card. From my experience this guy gets out of hand very easily if not handled immediately. Before you know it he attacks for 7. Also good in a late game when you have at least some board control. people who said he is bad. He will defeated by this card. if u play mech deck he is powerful then undertaker because he only need turn to powerful ,but undertaker need to drop deathrattle. and mech deck can dop him by 1 cost for next 3/2, next5/2, next7/2 still bad? 1/2 starter is enought to couter if he 1/3 he must be legendary card. This guy gave me some headaches during the arena preview. He can get out of hand quick! I thought he would be bad, but he is actually a pretty cool 2 drop. Paired with buffable creatures like beloved Undertaker or Mana Wyrm I can expect this card included in many aggro decks and in Hunters too, making themfurther powerful. and we have 4/5 and 3/2 ready to attack and grow further. Its 11 dmg after this turn, and next one quite possible be lethal. He has a stat value of 2/2 when its the opp. turn and he just keeps appreciating making him 3 would make him even more overpowered. Maybe if enough growing cards are introduced into the game Master of Disguise will become viable. I Like this card, it screems "deal with me". Not many 2 cost drops will stop a coined yeti on turn 4.... I will definetly test this in some control decks. This is a decent minion. You play it on turn 2 and then on your opponent's turn it's a 2/2. It also has synergy with some of the new cards. I'd also expect more synergy coming up. This'll be pretty useless, just like Gruul. An inferior version of Shade of Naxxramas, too slow.